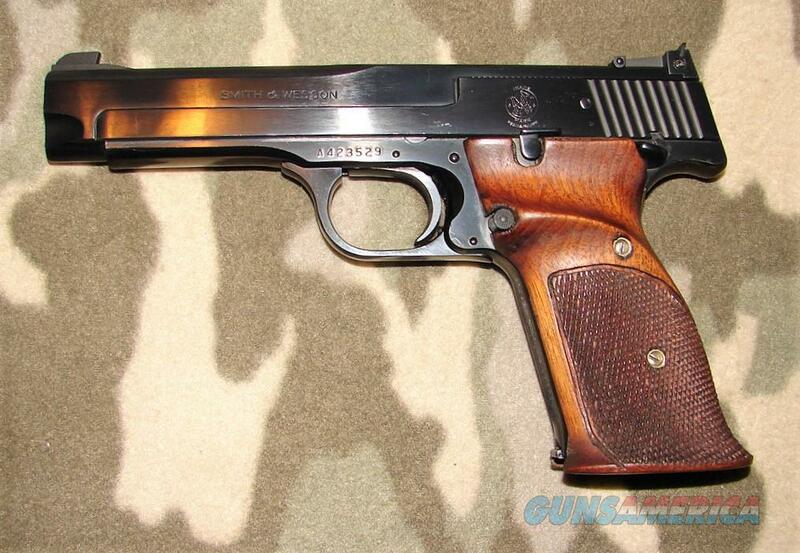 Description: Smith & Wesson Model 41 Semi-Auto Target Pistol S# A423529 5” bbl (rare) with an excellent bore. Manufactured 1 the finish on this earlier model target pistol is in excellent condition retaining all of its original finish showing only faint minor scratches scattered about the frame. The checkered walnut grips are also in excellent condition free of dings or dents. Features include the cocking indicator at the rear of the frame found on earlier model 41s. and a period correct (no label) 2 piece Bangor Punta box with shadow cut out. In all a fine lightly used pistol with the desirable cocking indicator and 5” barrel.